The future of Christ Cathedral is only possible with your help and support. Through the Heavenly Lights digital experience, you become a living part of the legacy and work of Christ Cathedral, by gifting the light of one of the Cathedral’s 11,236 glass panels. The work of transforming the Cathedral into a Catholic place of worship and community is only beginning. While respecting the architectural legacy of its original founders, extensive renovations are needed to the entire 34-acre campus to prepare Christ Cathedral to welcome a Diocese of 1.3 million members and growing, as well as to prepare the Cathedral itself for the sacraments. Your gift will shine forever, as the Christ Cathedral pursues its mission of embodying the Word of God for all those in our community and around the world. If you are considering the most appropriate use of your gift, we invite you to explore ideas from some of our current donors. Are you ready to take your place in Christ Cathedral? Celebrate new life coming into the world by gifting a Heavenly Light in the name of a child or grandchild. Honor the memory of a loved one with the eternal gift of a Heavenly Light in their name. Embrace and affirm a loved one’s first Communion with an eternal gift. Your personal journey will be marked by many individual moments of achievement. Give them their full due with a Heavenly Light to celebrate personal goals that bring you closer to the light of God’s love. Mark an important event or memory and ensure that it will shine forever, and share your gift online with friends and family. Observe the holiest days in the calendar by gifting a Heavenly Light to support Christ Cathedral. All funds received through Heavenly Lights will support continued improvements to Christ Cathedral and our ability to maintain the integrity and beauty of this building in the future. Funds will be allocated 50/50: half to pay for current renovations and half to the Christ Cathedral Endowment Fund to ensure future maintenance and support. 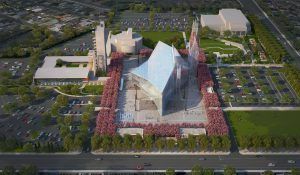 For more detailed information, we invite you to read about the two-phase plan to transform Christ Cathedral. When you dedicate a Heavenly Light, you are making a contribution to the Orange Catholic Foundation that will help fund both the renovation of Christ Cathedral and sustain it through an endowment fund to maintain the building. Your donation is tax deductible, less the value of commemorative materials received. That value is included on your receipt.